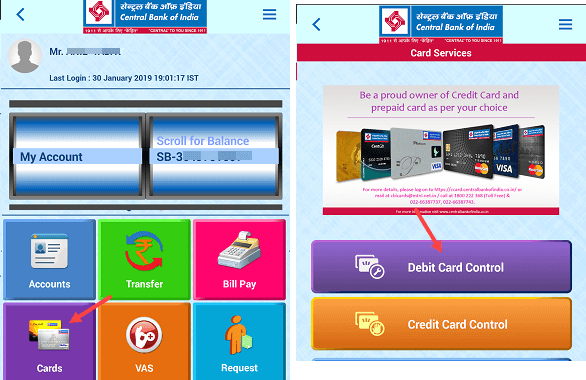 Central bank of India offers Lock for your ATM/Debit Card through Mobile Banking app – Cent Mobile. Now your CBI customers can activate/deactivate their ATM card anytime to secure ATM Debit card. 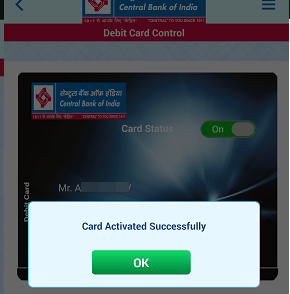 CBI customers can open Card Control option in Cent Mobile app and lock Debit card when moving out. Unlock it any time for use. Now you have full control over your debit card. Use Card Control to secure your AT against any probable unauthorized activity. See how CBI customers can lock/unlock their ATM Debit card online anytime. 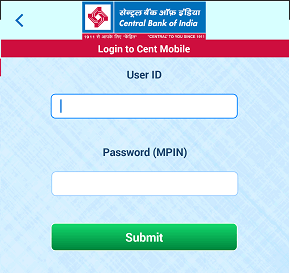 Login to CBI Mobile Banking Application – Cent Mobile. 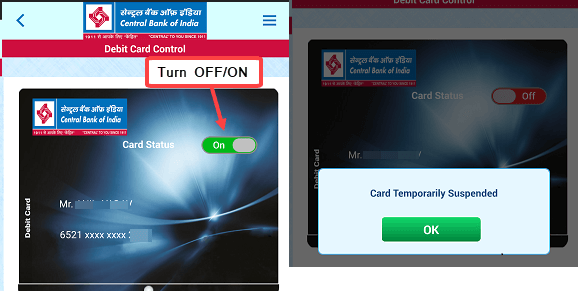 After login, tap and open Cards option and next screen select Debit Card Control option. On the next screen, to turn off (Deactivate) your Debit card usage, tap the ON button and your Debit card usage will be temporarily locked. You will also receive an SMS that your Debit card usage suspended temporarily. You can activate your Debit card anytime, just tap on OFF button and your card will be reactivated again. You will receive an SMS that your card activated again. CBI Debit card activate/Deactivate facility very helpful to secure your Debit card from the unauthorized transaction. You can use this option if you lost your card at home instead of blocking card permanently. You can block ATM Debit card temporarily in cases where there is a high chance of receiving your card back to you and unblock again through Cent mobile.